In the light of radical structural changes to our team, which became necessary due to a complete conceptual realignment, none of our four technical areas went unaffected. For the first time in our history, we implemented all-wheel drive, whose wheel hub motors generate a maximum of 4 x 32 kW. In perfect conditions, this translates to acceleration from 0 to 60 mph in less than 2.7 seconds. The fundamental idea in developing the eH14 was to use the engines for braking as well as for accelerating the car. 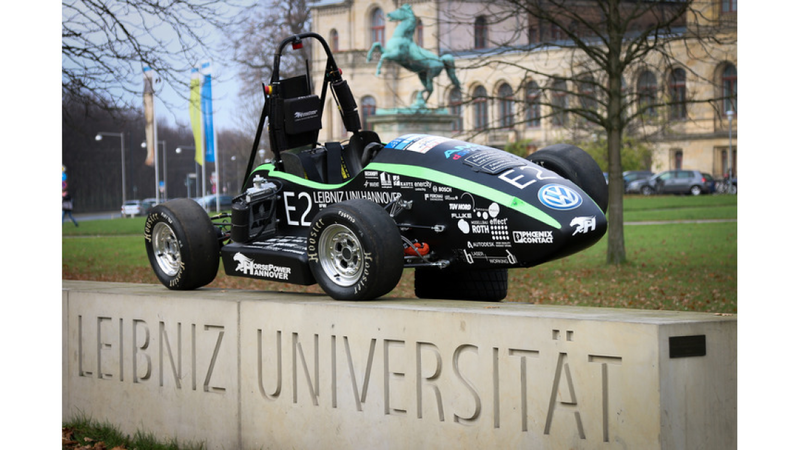 Thus, we were able to raise our efficiency levels and lower the car&apos;s overall weight to 213 kg, which results in a power/weight ratio of 1.66 kg per kW. To put this into perspective: a midsize sedan with a tare weight of 1.5 t would have to generate roughly 900 kW to achieve similar numbers. Apart from the new powertrain-concept, further developments dominate eH14&apos;s overall appearance, one of which is our chassis. For the first time ever, HorsePower Hannover constructed a CFRP-monocoque, which replaces the conventional tubular steel frame, upon which all of eH14&apos;s predecessors were based. The new chassis impresses with higher torsional stiffness at a lower overall weight. Additionally, the lowly positioned accumulators in our side pods contribute to the improved vehicle dynamics, because their positioning contributes to a low center of gravity.